Dr. Matthew Lukwiya could have held a comfortable medical position in England , the Middle East, South Africa , or wherever talented African doctors go, but he stayed in Uganda instead to fight for his people, the Acholi and died a harrowing death from the Ebola disease. Dr. Lukwiya, forty-two, was the medical superintendent of Lacor Hospital , a large Roman Catholic missionary hospital in Gula, northern Uganda . He had grown up poor in the region, his father a fishmonger, his mother a market trader, but a succession of scholarships sent him to school and medical school, where he continuously emerged first in his class. “Dr. Matthew,” as he was known to patients and staff, began his professional life as a staff physician at St. Mary’s Hospital, Lacor in Gula, a state-of-the-art modern hospital run by an Italian Roman Catholic missionary order. St. Mary’s treated eighteen thousand patients a year and five hundred out-patients a day, including army and rebel soldiers in the troubled border region. The bright young Acholi doctor, one of the best medical students in Uganda , was awarded medical scholarships and prizes. He had received a master’s degree from the prestigious Liverpool School of Tropical Medicine in England . Qualified and invited to serve in more affluent communities, but he chose instead to go where the need was greatest, his ancestrol home, Acholiland. Most well-qualified Ugandan physicians leave the country in search of better opportunities. But Dr. Lukwiya stayed home. Dr Matthew Lukwiya was in Kampala, 250 miles away, when news of the returning UPDF soldiers from the Democratic Republic of Congo (DRC), being flown to Gulu brought with them a strange disease spreading fast through the north and affecting hospital personnel resulted in his being recalled quickly to Lacor Hospital. Dr. Lukwiya was enjoying an interlude of study and family life after seventeen years of fourteen-hour workdays. However, he left his wife, Margaret, and their five children behind in Kampala and headed back to save his people in Acholi. Ebola, first identified in 1995 in the Congo , is transmitted through contact with infected body fluids, such as vomit, blood, or sweat. It had no known cause and no known cure. As might be expected, hospital personnel panicked. The nearly four hundred employees of St. Mary’s hospital were in revolt, and Dr. Lukwiya spent a day with them, inspiring some, cajoling others. He also took important steps to curtail the spreading epidemic, alerting authorities in Kampala to it, isolating victims in a special ward, and tightening safety precautions for medical personnel, whose bodies must be completely covered in protective gear before encountering patients. Dr. Lukwiya was one of the people who tried to make patients comfortable, but in doing so committed a fatal error, leaving his face uncovered. The mistake was not uncommon. Protective masks soon fogged up, making it difficult for doctors, who also wore gloves, to puncture veins and conduct other medical procedures. Soon Dr. Lukwiya was a patient himself. At first he thought it was malaria or another fever-causing disease, but gradually the truth was known – he had contracted Ebola, the 156th recorded victim of the outbreak. His wife came north but could not touch her dying husband. The best she could do was sit at a distance, clad in protective gear, and hold his foot with a surgical glove. He died on December 5, 2000. A diagnosis machine that was sent to Gulu following the Ebola outbreak by Acholi sons in the Diaspora was immediately snapped up by the Museveni government and transferred to Entebbe , leaving hundreds to die needlessly. Lukwiya’s death was a terrible shock to the Acholi community, who continue to face the Museveni genocide project with delgent, Ebola, like the concentrations camps was just another tool to wiping out the Acholi people. Lukwiya was one of those rare, selfless individuals who never failed to act swiftly on behalf of his people. 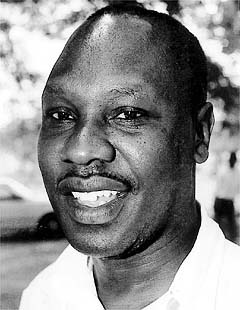 His death was a devastating blow to his people, the Acholi community he served.The honorific title of “hero” falls easily from our lips these days. We call Generals who have won the pips in the killing fields of Acholiland. Yet the true title of hero should be hard-won. It should capture the sacrifice of self-interest for the benefit of others. It should describe those whose actions surpass by far what duty demands. To the Acholi people Matthew Lukwiya will forever remain their hero. Because they give their all, the lives of heroes are often short. Dr. Lukwiya was the first to recognize that people were contracting the Ebola virus and is credited for the relatively low death toll, which reached 162 last December. Once he identified the virus, he organized his staff and international bodies such as the WHO to combat the deadly contagion. Amidst a climate of hysteria regarding the outbreak, Dr. Lukwiya’s death only fanned the flames of fear. But his work was instrumental in preventing the spread of the virus. There is a further dimension to heroism. Heroes and their actions inspire those who follow; they challenge us to match our efforts against those of the hero and see how we measure up. The value and meaning of Dr. Lukwiya’s heroism will be fully realized only when physicians accept the challenge to measure up by dedicating their professional efforts to eradicating the global catastrophe of AIDS. As earlier plagues such as small pox and polio have elicited their heroes, AIDS demands its own acts of heroism. Dr. Lukwiya and others like him have shown us an example and thrown the gauntlet in front of us. 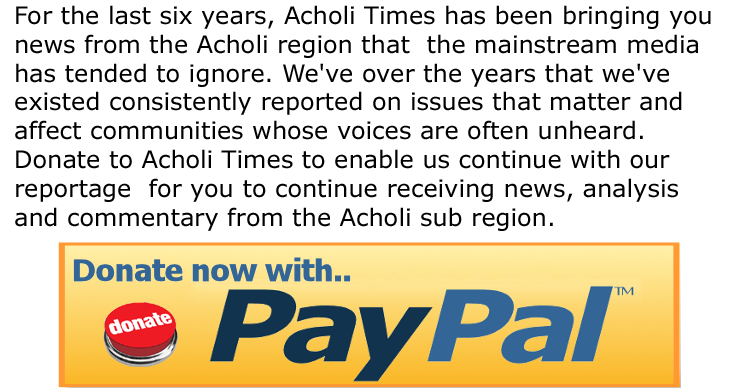 For his valiant effort at combating a deadly epidemic, and his resolute commitment to his people, Acholi Times humbly remembers, the Acholi hero Dr. Matthew Lukwiya. Blaine Harden’s article (Feb. 18) about Matthew Lukwiya, a doctor who did everything humanly possible to keep his hospital going and his patients comfortable in the face of the Ebola virus, was riveting. I could not put it down. I cried when I read that Dr. Matthew paid the ultimate price — sacrificing his own life.